Some years ago a photo was published in Harper's Magazine (and I later learned in other prominent places) that struck me as iconic of the conflict in which the United States is engaged. 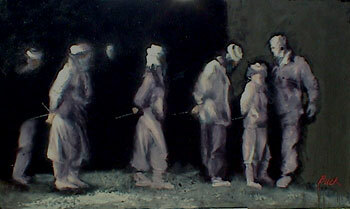 It was your photo of the hooded prisoners being led to prison in Afghanistan. This photo has been transformed into a 3' x 5' painting which I will send to you (at no cost to you) as I believe you should own it. It was painted by a local Ashland artist, Phyllis Buck. With the current Oscar award to "Taxi to the Dark Side," the painting of your photo may be helpful in your photographic career. Please reply if you are interested or not in receiving this painting. If not, I will offer it to a worthy organization such as The Center for Constitutional Rights. I'm enclosing a self-addressed envelope for your convenience. Again, I believe your photograph sears the American soul and must remain imprinted in our memory. I imagine some photographers get letters like this often. Not me. I hope I have the opportunity to take other photos that people might regard in a similar historic respect. And when posting this entry I noticed that the painter Phyllis Buck's Webmaster (I suspect) titled the image "Abu_Grahib.jpg". Which shows how the idea of the image of prisoners has transformed from the time I had taken the photo on Dec. 19, 2001 to the time the Abu Ghraib prison torture photos surfaced in late April 2004 to today. But most disturbing is how the war in Afghanistan and the invasion of Iraq have become the same thing in too many, or any, minds.